Hi everyone! I’m excited to introduce a new complimentary pattern, the Virginia Reel Pillow. Virginia Reel is a quilt that I designed for the folks over at Fat Quarterly. Most of you are probably familiar with that magazine, but if you are not, it is an online-only magazine that comes out 4 times a year. Each issue is absolutely chock full of quilts, projects, interviews – with no ads. It is really a great deal. 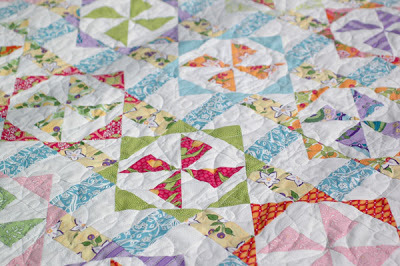 For Issue 6, which comes out early next week, I designed a quilt called “Virginia Reel” in my Veranda line. I called it that because it is comprised of dozens of pinwheels that seem to spin between pairs of columns, just like dancers in a reel. Hop on over to Fat Quarterly’s blog to download the pattern for the complimentary coordinating pillow, or, if you would prefer a traditional pdf to google docs, you can download it here. 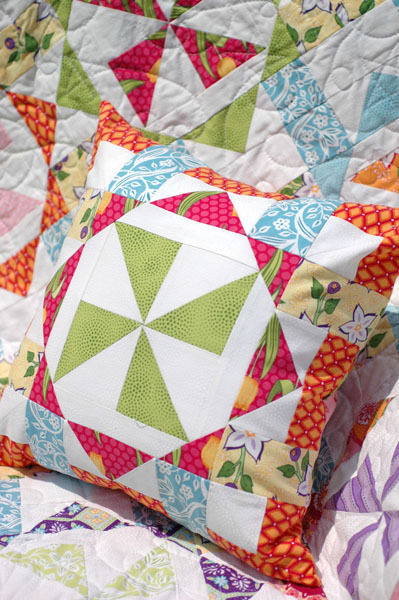 The columns and rows upon which the pinwheel hangs wrap around to the pillow back! Yes. I used more Doodlebug buttons for the back. Buttons with stripes! Can’t get enough of them. I’m giving away my sample of the pillow right here! I so enjoyed reading your comments last week about favorite handmade gifts you have given others, so to be entered in this giveaway leave me one comment on this post (only one please) telling me your favorite handmade gift you have been given. Remember to leave me a way to contact you should you win. And please become a follower, if you aren’t already. The deadline is this Friday the 29th at midnight. Good luck and happy sewing everyone! I'm looking at my favorite handmade gifts right now. My friend is a potter and she made me 2 fat little hand built birds with silly long beaks. They make me happy just looking at them. Hi – my favourite handmade gift was a handknit striped cotton sweater for my second born son. A dear friend knit it for him. I have never received a handmade quilt, although I have given away a few. Doesn't seem fair, does it?!? Embroidered guest towels. They were so gorgeously done I felt bad using them! my favorite handmade gift I was given was a mini puppet theater my husband made me as an engagement present. This theater had working stage lights and slots for changing backgrounds, and a roll up curtain. I still have it! My very talented friend makes handmade journals and has given me a few over the years. I am constantly sketching ideas and I love that I get to collect them all in such a beautiful enclosure. Thanks for the giveaway! lovely pillowcase! I like quilling and one of my favourite handmade gifts would be something using this technique, with some kind of stitching added to it. Thanks for the chance! 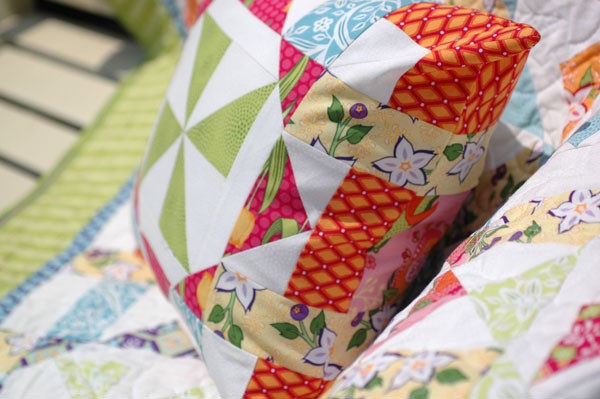 Thanks for the lovely giveaway – Your pillow is gorgeous and I think I'll be wanting to make the quilt when I see it! Fat Quarterly is great. The best, most favorite handmade gift I received was from my best friend, a book of hand written recipes and memoirs of our friendship together. I received it 20 years ago and still have it today! One of my favorite gifts is a crocheted afghan from my mom! I hate to say it but I don't think I've ever…oh no scratch that! It'd be the awesome drawings from my nephew! A cushion printed and sewn by my then 12 year old son! Wow that is a gorgeous pillow, I've downloaded the pattern already! My favourite handmade gift is the bed that my brother made for my husband and I! It's still in use 15 years later. I really had to think about this one…I'm usually the one who gives the handmade gifts! I would have to say that it would be a matching hand knit wooly scarf/hat from my knitting daughter a few years back. It's a lovely set and I love that she made it. My favorite gift is a quilt that my Mom made for me. I think of her every time I see it and all the special memories of sewing with her over the years. My goal is to have my house filled with artwork made by friends. It is a great way to be surrounded by things you love. I have a few photos taken by friends that I cherish. Those would probably be my favorite. A candlestick made from wrought iron from my boyfriend, his dad was a blacksmith with a forge in his garage! Cute pillow! Very happy! My favorite gift is the quilt my Grandmother gave me for a wedding gift in the early 70's. All hand pieced and hand quilted and the fabrics were from old clothes worn by her and other family members. 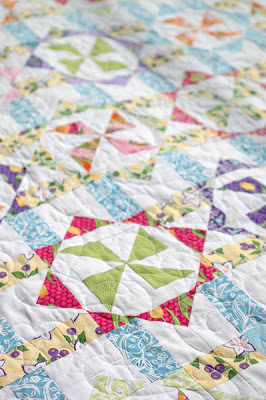 She's been gone for decades, but her quilt lives on! My favorite handmade gift was a baby blanket for my daughter when she was born. It had my favorite colors in it Blue and Red. Sadly it went missing one day and couldn't find it anywhere, about a month later I found it at the babysitters, however she said it was someone else's and would not return it to me. I really loved that baby quilt and wish I still had it today to give to my daughter now that she is grown. Thanks for the chance to win this beautiful pillow. I love your pillow! I can't pick just one hand made gift and so I guess it's a tie between the little plaster of paris hand print that my daughter made me when she was a little girl-a long time ago OR the handmade quilt that my favorite great aunt made for me when I WAS A LITTLE GIRL! A few years ago a catalog came in the mail from Colonial Williamsburg with some quite expensive gifts inside. One of them was a patriotic quilt (mostly white with stars scattered here and there–it was beautiful and definitely fit the Williamsburg image). I loved it! My 20-something daughter must have picked up on the fact that I really wanted that quilt, and for Christmas that year I opened a quilt–not from CW but a duplicate that my daughter made just by looking at the small picture in the catalog! Oh my! I could not believe it! Keeping the project secret was no small feat. She worked on it whenever I would leave the house, and even the week before Christmas when she came down with pneumonia I found out she was sewing away. I never suspected a thing. The quilt has many loving memories. Thanks for the chance to remember this handmade gift of love and write about it here. I'd love your pillow giveaway! While I have been crafty all my life, my daughter sadly is not. But when she was twelve, she gave me a hand-cross-stitched card for Mother's Day – one that she made with lots of blood, sweat and tears (seriously, there's blood on the back!). It sits in pride of place on my desk and has ever since she gave it to me 15 years ago. Only love could have made her do all that stitching!! Beautiful pillow, by the way!! Thanks for the chance!! Wow my favorite hand made gift has to be plaster hands my grandkids gave me. They pressed thier hands in plaster and made a trivet out of it. I got two one for each grand child. I love them. My favorite handmade gift was from my sister for Christmas a couple years ago. She made an album of us growing up and all the fun stuff we did! My favorite handmade gift? I'd say it is the Cross Stitched Wedding Sampler my made for me. I need to see if I can take picture(s) of it. I also have a favorite handmade childhood gift — it is a pair of raggedy ann and andy dolls my sister-in-law made me. (My oldest brother is almost 10 years older than me.) I still have them even though the eyes and noses are worn off and need to be re-embroidered. Overall, they are in good condition. One of my favorite handmade gifts I see every day in my sewing room… it's a fat pin cushion lady made with a clothespin body. My niece made it for me about 10 years ago and I still use it! Her hair looks a quite frightening now, but she's still with me, much to my niece's surprise! My favorite handmade gift was a sweater my mom made for me that my daughter now wears. you leave it in the book you're reading between the pages so you can easily find where you last read. The back was made of green felt and on the front my friend had embroidered a lamb that is standing underneath the sun (and you can see the rays). Without a doubt my favorite/best handmade gifts are the Christmas ornaments that my sister gives me each year. She doesn't make them herself but scours the local craft shows and finds the most unique ornaments. It is such a treat to put them on my tree and to feel her presence! Thanks for the great giveaway! Hello Amanda. Your fabric line looks wonderful! My fav handmade gift was a tea cosy a friend made years and years ago. We still use it and I think of her every time I make. I think that's what makes a handmade gift so wonderful. Easy answer! Years ago I lived in Japan, and I picked up some filet crochet pattern books in the craft store there. All of the patterns are picture patterns, which mean you don't have to read Japanese to figure them out. I sent the books to my mother who is also a crocheter, and she was a bit intimidated by the patterns being they do have a bit of words in the beginning, but after crocheting for so many years, she jumped right in and started to crochet. I knew she would enjoy a new book from another country. What I didn't know was that she would make something for me. For my anniversary one year I received a huge tablecloth for a formal diningroom made out of filet crochet. It is my prized posession. I take it out only for formal occasions like Christmas and Thanksgiving. I will cherish it always, and pass it down to my family with strict instructions on how to care for it. Moms are the sweetest! An embroidered pillow that my friend did for me. The color just goes with anything and the embroidery was done in all one color to match. Judy C in NC thinks your pillow is a wonderful giveaway – I have a spot picked out for it. My 94 year old Great-Grandmother recently gave me a scrappy quilt that she made sometime around 1940. All of the quilt is hand sewn. I cried when she gave it to me and could sit and look at it for hours on end. To me this quilt is priceless and the best gift ever! For me, it would have to be anything that my kids have made for me over the years. My kitchen window sill is full of little pottery projects etc. that they have given to me and they always make me smile! Cute pillow! I love the dancing pinwheels. My favorite handmade gift is when my mom gave me a scrapbook. I had just moved from Alaska back to home and she gave me a memory book based on my 2 years of living in Alaska. What a surprise! 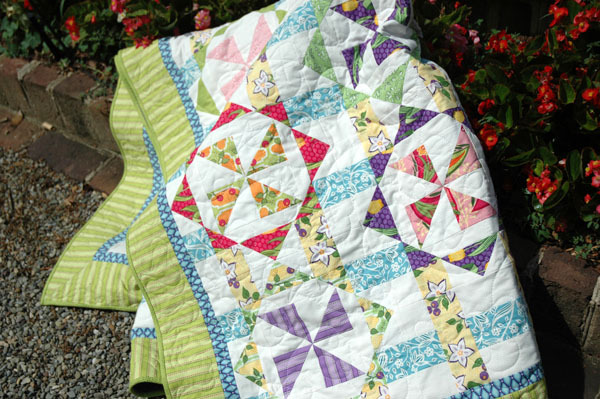 Gosh, I couldn't say that I have a favorite.My mom has made me several quilts and my bloggers friends have made some very sweet things for me that I just can not pick one thing. I have gotten pillows, quilts, wall hanging, pincushions, etc. I just love them all. What a great gift…to receive a pillow from you. I have written before about a pillow I made for my daughter…so now I tell you the next favorite was a plaid wool shirt for my sweet father-in-law. I was ble to match the plaid on the entire shirt including the button placket. It made me happy to see how he liked it. He wore it often. I've been blessed to have a couple handmade gifts that mean a lot to me. I couldn't live without the blankie and pillow my mom made me when I was little. Neither one are around anymore but I still remember the silky fabric and green gingham. Typically, I make handmade gifts to give away, but don't receive many in return. The only thing I can think of is that my mom makes some silk flower arrangements and I appreciate her sharing those with me! you know, I don't know that I've been given many handmade gifts. I think people are somewhat intimidated by the fact that I quilt or sew. My favorite was a quilt my SIL and her mother made for my son when he was born. We all use it all the time and I love it! The dearest handmade gift was given to me by my daughter when she was 8 years old. It was a hand-sewn mug rug that she created while hiding in her closet at Christmas time! What a beautiful surprise!! My favorite handmade gift is a quilt that my grandmother made. She used a cheater cloth and handquilted the outline, but it is the only thing that I have from her. Your pillow is lovely. my favourite handmade gift wasn't really tangible; one christmas morning, my sister read a poem to my family which she had written. 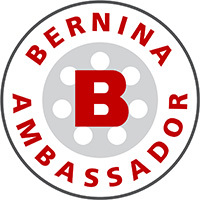 it included every single one of us and our individual characteristics… it was AWESOME! she'd written it in the style of Twas the Night Before Christmas. it's the best and most favourite memory i have of our family at christmas time. My favorite handmade gift that I received is the Chinese Puzzle Quilt that my mom made me. It took her 14 years to finish it, but when she finally did it was the most special thing to me. She started and stopped so many times and ripped the entire thing apart at one point. At 30 years old, I am still sleeping with my "blankie" 🙂 Luckily it is vintage now, all the fabrics were purchased over 25 years ago and it perfectly matches my bedroom decor! My favorite handmade gift, by far, is jewelry designed and created by my daughter!!! My favorite is an apron that my sister made for me. Thanks for the giveaway! My best friend cross-stitched me a picture years ago that says old friends and old quilts the great comforts of life. My first quilting teacher made a small Christmas quilt for everyone in her class(1993) of a Christmas angel. I hang it every year and love it. Knitted scarves from my mom are my favorite thing to receive, not only do they keep me warm they look great rolled up in the basket by my front door. When I was in college my brother made me a vest out of old blue jeans. He was away at college himself and we had limited $ . He did not even know how to sew- or sew i thought! I loved that vest. Favorite homemade gift I've received…Okay, we're going way, way back in time here – like twenty years or better, hehe – but one Christmas, my dad made me a dollhouse. Complete with cedar-shingled roof and "popsicle" hardwood floors. Totally awesomesauce dollhouse :o) I still have it, and hope to redecorate it with my future daughters one day! I enjoy each and every thing my children have made me, but lately a lovely pillow with my name on it from my daughter. I cannot choose one favorite handmade gift! I have several quilts, hardanger pieces, knitted sweaters and afghans from my (late) mother, cross stitch pictures from my mother-in-law and daughter. And I love each piece! I'm very fortunate to have a creative family. I love your pillow!! My favorite handmade gift is from my daughter. She was 8 and in school and made bowls from clay. It is sho misshapen that it's cute! Twenty years later I still have it out and displayed!!! My favorite handmade gifts are several but I will mention only the gorgeous jewelry my daughters and granddaughter have made for me. I treasure it all. My now deceased father was a fantastic, gifted painter in his retirement and I have several of his best work hanging on the walls of my house. And a beautiful wall quilt my oldest daughter made for me with my favorite design – hearts – incorporated into the design. I could mention so much more, but these are perhaps my favorites. I LOVE your new fabric collection, absolutely gorgeous. And the pillow design is so beautiful and colorful. I'd love to win this treasure! My favs are the little drawings and colorings my kids make me, love them. Thanks for sharing such a cute pillow and fabulous pattern. Adorable pillow! My favorite handmade gift is the mug my sister made me, it my special coffee mug! It's hard to pic a favourite, but I think the most used handmade gift I received was a sock project bag someone sent me as a thank you for a prize I sent them in a competition – it's used (and cherished) every day! My late grandmother (who taught me to sew) made me a string quilt about 20 years ago. I was made from clothing scraps. Although it is far from "perfect" I treasure it and the memories it holds for me. Love this pillow! My favourite hand made gift is a recent one – a lavender scented pyramid shaped doorstop made by my neighbour. When one son was a junior in high school he made me a 5' X 7' china cabinet for Christmas. The next year he made a 4 piece bedroom suite which we used on loan from about 10 years. He finally gave it to us because he mismatched some of the wood grain and it would bother him every time he looked at it! My favorite though is the remodel of my fruit room that he organized and oversaw as a Christmas present 5 years ago. In one day our 6 kids and spouses completely cleaned out my fruit room, redid shelves, added more storage space, discarded way out of date food, and restocked. I think of him and the rest of the family every time I go into that room. I have many treasures and I love them all, so much love in the making and the giving. They all warm me. My favorite handmade gift is a knitted afghan my Grandma made for me. She knit squares of assorted colors of yarn, and then single crocheted around the edge with black yarn, then crocheted them together into a "patchwork" afghan, and did a couple rows of black single crochet around the edge. The amazing thing is she was in her 80s and blind when she made these knitted blankets for each of her grandchildren! I might be missing a few, but there were at least 19 grandkids! Although there are a few mistakes, it couldn't be more perfect to me! Love your pattern and the pillow-thanks for the chance to win!! So pretty Amanda! 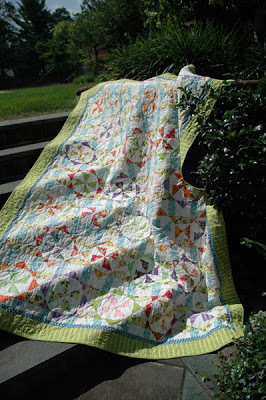 Hop over to my post today and see the vintage quilts my mom bought years ago and are now on my twin girls beds. They are so unique and the color palette is gorgeous. You have probably used this design before. I have not been given many handmade gifts but I give a lot of handmade gifts! I was given a sampler quilt made by my quilting friend, Cheri. She lives in CA and I live in NC and we originally "met" online in the old Prodigy quilting bulletin boards. We've had the pleasure of visiting each other through the years and remain friends. My favorite handmade gift is from my sister and Nana. Nana made Yo- Yo's cleaning out my Mom's house was this box full of them. My sister made table runners, pillows and little dollies made from the yo- yo's. I received the pillow. Thanks for a chance to win your beautiful pillow. My sister makes the most wonderful photo albums/scrapbooks and I love them. I'd always planned on doing albums of each of my boys' first year (I have 3!). I thought that wasn't too ambitious. But, my mind can't do it…I need order and scrapbooking just doesn't really work that way…but sewing does! So, my sister made an album for each of my boys – I can't thank her enough! Thanks for the chance. Your question really made me stop and think. I haven't really received many handmade gifts! I do have a lovely magazine rack. My sister-in-law hand quilted the fabric and her husband made the wooden rack that it covers. So when I DO receive something handmade, it's a doozy! One of my all time favorite gifts came from one of my students, a drawing of the two of us and God. I still have it framed and hanging on the wall. Most of my favorite gifts are handmade, such as the Mariner's Compass quilt and matching pillows that my mother made for me. Your pillow looks great! My favourite hand made gift was a needle/cross stitch book 🙂 Made for me by one of my dearest friends! My favorite hand made gift came from my husband, who was able to craft a blanket crane for me to hang a quilt on. I was so happy that from a picture I found he made me something beautiful. I almost said the quilt my grandma pieced and my mom quilted, and it is very precious to me. Then I remembered the ceramic gingerbread man my son made in 4th grade. His was a pilot, not a traditional gingerbread man, and it came with a poem likening me to a hangar. I love it and cry every Christmas when I put it and the poem on my tree. He will be 26 in a few short weeks. Where would a plane be without a hangar…what beautiful poetry to a mom, lol. It might just be a jar with macaroni glued all over it and then spray painted gold. It sits on the mantle over my fireplace. I love it. My mom used to make me dresses–for holidays, for grade school concert performance, once because I wanted a beautiful pink silk dress even though there was zero chance I'd be asked to a dance. She was a wonderful seamstress, but it's her patience and selflessness that I treasure most. Those were my favorite homemade gifts. The best gift I've ever been given was done years after it was made. It was a handmade baby quilt my Grandmother had made for me when she learned I was expecting my first child. She never gave it to me because I lost that baby at 5 1/2 months but she kept it and planned to give it to me at a later date after the pain was not as bad. Sadly, my Grandmother died before she was able to give it to me and when my Mom was there helping Grandpa clear out her things they found taht quilt. It was all wrapped up in pink tissue paper as it was a little girl and she had the card she had already written for me inside the box and my name was on that box. When Mom found it she brought that back home from Missouri to give to me. Of course, when I saw that I bawled for hours thinking she had made that for me and never got to give it to me and of course, that pain of losing what was to be my only daughter came flooding back to me as well. ugh. Amanda a side note – you have the date for the end of this giveaway as July 24th which I'm assuming you meant tomorrow, July 28th? Thank you also very much for the link to that gorgeous pillow here. I tried all I could think of to download that from Fat Quarterly blog and no matter which way I tried it was giving an error. I wasn't even able to print it sadly so I was very pleased to see you had a different way to download here. Thank you very much. 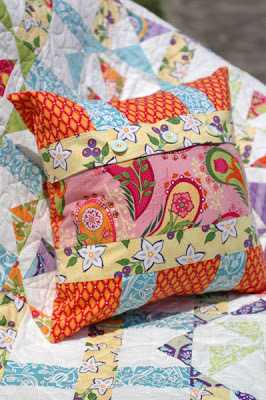 the quilt & pillow are super cute! I think my favorite was a crochet afghan for my DMIL the year after my husband and I were first married. she loved it & got tears in her eyes when she opened it up! Adore the pillow and could quite happily kill for it. Okay maybe not that far. Anyway my favorite handmade gift was a Lizzie Kate cross stitch saying "Grandparents are Grand" that my DD#1 stitched for me around ten years ago and on my bedroom wall it still hangs where I can look at it every single day. I love the color placement in the Virginia Reel quilt…makes those pinwheels really spin! Great quilt design! looks like tradition with a POP! 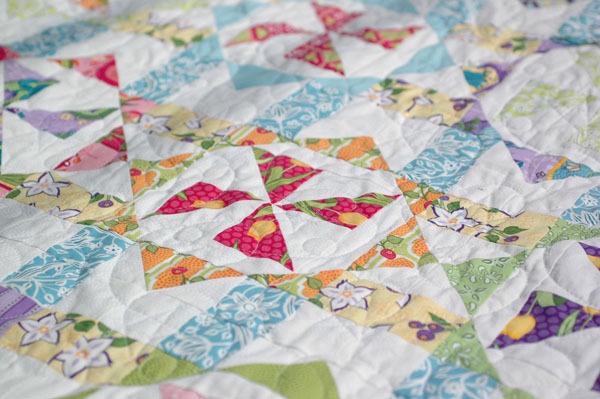 Amanda, thanks so much for your post today on Sew WE Quilt! 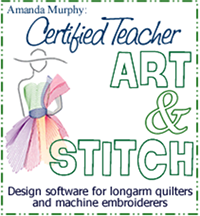 I am your newest follower and I can't wait to spend some time going through your posts and looking at your quilts! thanks for a great tutorial. You have some great fabric lines. Love the purple in your newest one. I enjoyed your Lampshade tutorial. my favorite handmade gift is the quilt on my bed that I was forced into making when I was 16. I hated it and let mom keep it. She made sure it was mine before she passed. My favorite handmade gift is a quilt my grandmother made. My mom brought it home after my grandmother's funeral, and gave it to me, so it carries with it the sweetness of two generations.